Adventures in the kitchen and beyond. This is a regular feature of the Cuban weekday menu, perfect when you're pressed for time. It is easy to make and a very satisfying dish. It's also a good way to sneak some vegetables into a meal for picky eaters. Description: A tasty, colorful, and super-easy meal to prepare on busy days. * The traditional recipe calls for Vienna sausages (the kind you get in the little cans) but we prefer the taste of hot dogs. ** FOR THE MIXED VEGETABLES I put my own together using frozen peas, carrots, corn, and pearl onions. These are all pretty essential to the dish, but if you don't have pearl onions on hand, simply chop some onions and sauté those in the pan until they are translucent and soft, prior to adding the rice. You can also chop some red pepper and sauté that along with the onion, if you'd like. Use a pan for which you have a lid, as you will need to keep the lid on while the rice cooks down. If you don't have such a pan increase the liquid slightly, to adjust for evaporation, and cover the pan with a sheet of aluminium foil while it cooks down. 1. Coat the bottom of the pan with 2 tablespoons of olive oil over medium heat. 2. Put the rice into the hot pan and stir the rice around to coat evenly with the olive oil. Allow the rice to cook in the oil until it turns slightly more a solid white than a translucent white. About two minutes. 3. 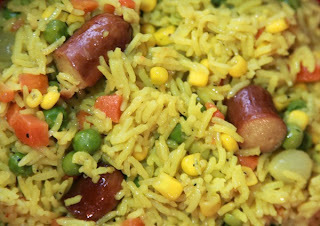 Toss in the sausages and stir them around with the rice for a minute, then add the two cups of liquid. If the temperature is right, this should sizzle a bit. If it does not, allow the water to bubble before adding the seasonings. 4. Add turmeric and stir to distribute it evenly. 5. Add salt and pepper as needed. 6. Add mixed vegetables and cover with the pan lid, lower the heat down to a simmer and allow it to rest untouched for twenty minutes or until all the liquid has been absorbed by the rice. It's always good to know what a plate costs you to make. Restaurants keep this in mind, why shouldn't we? These are only estimates for reference. Your local ingredient costs may vary. Currency converted at DKK5.00 to the Dollar and DKK7.50 to the Euro. Did you make it? Did you enjoy it? Did you improve on it? I'm eager to hear whether you found this dish as tasty as we did. Please comment below with any remarks, critiques, or alternative suggestions you have to make this recipe even better! I've provided translation so that all my fellow cooks can follow the recipes and blog updates, regardless of their local language. Let me know if you have any difficulties with the translation. I want to be sure that the Posts and Recipes are easy to understand, regardless of your home language. Please post a comment under Uh-Oh's if the translation isn't working properly and I'll report the problem to Google Translate Services. Thanks! © Marisa Garcia. Theme images by linearcurves. Powered by Blogger.